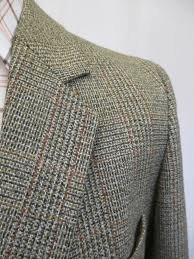 If you are reading this Blog regularly you will know about Tweed, its versatility, its longevity, its warmth, its ability to transcend fashion in the world of Menswear. You’ll probably understand the fact it’s a good idea to have some, especially now the winter months are fast approaching. I’m not going to go over its History or the Makers Process, Nick covers that with aplomb elsewhere. 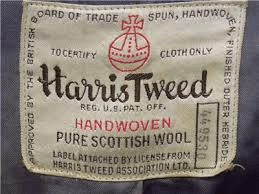 A number of traditional men’s retailers still sell Tweed, or more specifically Harris Tweed Jackets. But they are expensive, which is completely understandable. The fabric is handmade, they are made to last a lifetime and a lot of effort and care has been put into their construction. Some modern Fashion brands such as Margaret Howell, Beams Plus and famously Ralph Lauren produce jackets in Tweed. You are looking at paying between £250 and £900 off the shelf. But there is another way, and that’s second hand. It’s not for everyone, I understand that some people just don’t feel comfortable wearing someone else’s clothes. But bear with me, if you want a Tweed Jacket, in my opinion, looking at secondhand is the best option. If you choose wisely, with care and follow some simple advice you can buy one that will be with you for years, have all the benefits of Tweed, but without the cost. Charity Shops do occasionally throw up a bargain, depending on your luck and location. But the two places where you have the greatest choice are eBay and Etsy. An eBay search alone throws up nearly 11,000 items under Mens Tweed Jackets, Etsy about 2,000. These vast numbers shouldn’t intimidate, they should encourage. There’s bound to be something out there that’s perfect, but you need to put in the work. eBay may have more absolute bargains, but there are many Vintage dealers on Etsy that have great stock. 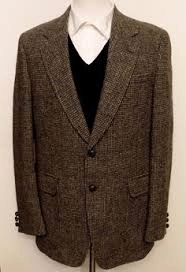 Tweed Jackets generally fall into two main categories, a Traditional, boxy style that tends to date from the 50s or 60s, or a slimmer two button style that will date from the 70s. The earlier style will tend to have smaller lapels and one rear vent. The later 70s style will usually have a larger lapel, a more pinched waist, and will sometimes have two vents at the back. As far as pockets go, the only variations would be a ticket pocket and that some 70s jackets will have patch pockets which are rarely seen on the sixties Jackets. It really depends on your preference. One of the objections that people have about buying online is sizing. Often items are described merely as Large, Medium and Small. Even the slightly more helpful 40″, 42″ etc isn’t ideal when buying. Okay, you can use your local tailor but, because of the choice, it’s best to get it as right as you can before buying. All the bigger Vintage Clothing Suppliers will give accurate dimensions. The need to know is Pit To Pit size, Overall Length, and Sleeve Length. Because of the variations in sizing over the decades, if you can’t get these sizes from the seller, then don’t bother, just look elsewhere. As a basic rule, generally, a vintage size will be a bit bigger than modern sizes, however in my experience sleeve lengths are a common adjustment on Vintage Jackets, as people bought these items as a lifetime purchase you may find that they will have been adjusted at some point in their past. 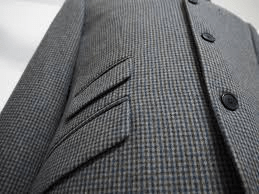 If you’re tall and lanky, you don’t want the jacket from a short and stout gent, even if your chest measures the same, there could be many inches difference in arm length. Labels for sizing are rare and will tend to have been removed or worn away. If in doubt, or if sizing isn’t listed, then ask, a decent seller, and most are, will do it for you. There are a surprising amount of nearly new or unused jackets out there. And one brand stands out in this respect. Dunn &Co. went to the receivers over 20 years ago now. They were if you don’t remember, a very traditional menswear shop that just couldn’t keep up with the times. However this meant that they had a lot of unused stock left over that was bought up, predominantly by Ciro Citterio that had plans to relaunch the brand, but then they too went bust. So all this stock has filtered its way through various sellers and now often pops up on eBay and Etsy, its excellent value, always UK-made and nearly always Harris Tweed. The main wear and tear points tend to be lining, buttons missing and Moth damage. All these things are fixable, but its whether you want to, there are plenty of jackets out there that won’t need any repairs or will have had repairs done already that are usually invisible. Bear in mind most of these jackets would have been the owners main after work wear and will have been worn a lot, but also taken care of. Smell, that musty odour that makes it seem as if it has been stored in a Horse Box, can be a problem. Again most of the larger or more experienced suppliers will have had had the item dry cleaned or aired and will say if there is a residual smell. Nick covers how to sort this elsewhere on the blog as you’ll probably know. 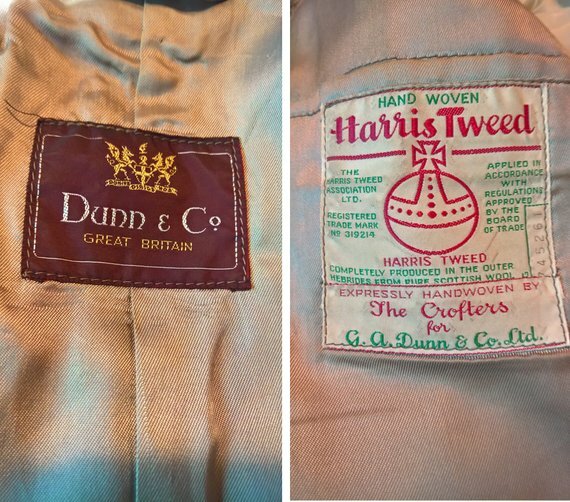 A picture of the maker’s mark or Harris Tweed label can be a good indicator or condition. I’ve already mentioned Dunn &Co, price-wise £30 is about average for a decent quality one that’s had little use or is in great condition, 70s Style ones will be a bit cheaper. 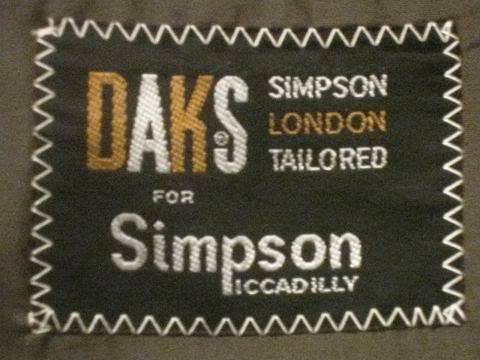 Another brand I would always look out for is London Institution Daks Simpson, They are beautifully made, use high-quality fabric and are available in a range of styles and fabric They can be more expensive, to the £50 -£100 price range but still represent excellent value. 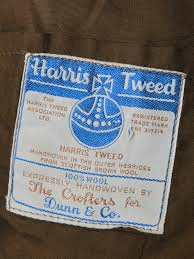 But really Tweed jackets will mainly have either no label bar the Harris Tweed Label or the label of the shop it has been sold through that can range from obscure German retailers to a local town emporium that has been dressing the great and the good as far as anyone can remember. The key thing is if it has the Harris Tweed Label, then you know at least the material will be long-lasting. 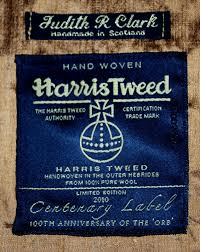 We all know that Harris Tweed is the daddy of them all, famous throughout the world for its origin and quality. And it would generally be my go-to fabric for a tweed jacket. I sort of know before buying that it’s going to be a fairly heavyweight, warm and slightly rough to the touch. But lighter weight materials, using Pure New Wool are also well worth a look. Tweed isn’t always the easiest fabric to photograph, because of the mix of colours and shades it can look completely different in sunlight than dull light. So if the seller hasn’t taken a close up picture of the cloth then ask for one. It’ll give you a far better idea of the makeup of the cloth. Bladen does a beautiful material called Supersax which is a very closely woven fine fabric that’s very warm and is the first choice of gentlemen farmers. 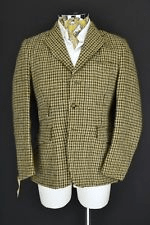 There are lots of Tweed jackets listed that wouldn’t look out of place on a 1970s US Sports Broadcaster or News Anchor, unless you are going to a fancy dress party, perhaps best avoided. Buttons are almost universally those leather football types, some like them, I usually replace with a decent Horn Button as it I think it improves the overall look. It is possible to discern the age of a Harris Tweed between before or after 1994. 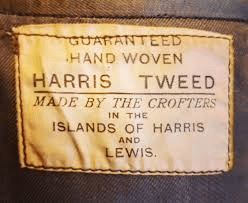 The Harris Tweed authority was established in 1994 and the text on the labels changed to reflect this. Apart from this there has been a huge number of labels in use over the years, seemingly without much control. So, you’ve decided, seen the one that ticks all the boxes and you are sitting waiting for it to be delivered. You try it on, and it’s nearly right, because you’ve done your homework, but it’s not quite there, not quite perfect. But that’s fine, Do not panic. Think about any minor adjustments, and hopefully, it will just be minor if you’ve followed the sizing advice, then contact your local friendly tailor and tell them exactly what you want to be done. Then just enjoy it, it’ll be with you a long time, hopefully! Good advice, especially the colour changing with the light, close up will show the true colour, also the pit to pit measurement is a better wat to get the right size. I have a mans harris tweed by DAKS, WORN OUT SFTER FORTY ODD YEARS. LIGHT BLUE AND FAWN CHECK, . LOOKING FOR A SIMILAR REPLACEMENT.